This past week has been absolutely INSANE! My hubby left for a week long business trip, leaving me and the kiddos for a week of crazy and busy happenings. Then my parents asked me if I would come to their house to watch my two younger siblings (remember the big gap I told you about in our ages) while they went to a work party for my dad out of state. So needless to say, it is pretty busy around here. It seems whenever I am cooking at someone else’s house, in this case-my parents’, they never have what I am looking for. Then again, my pantry is stocked for a food bloggers needs, so not everyone will have what I am looking for haha! :) So after browsing through my parent’s fridge and pantry, I decided this was our best option. This one of the EASIEST dinners I have ever made and it turned out absolutely delicious! Thumbs up all around! Only FOUR ingredients! This is perfect for those days you don't want to be in the kitchen forever! Family approved! In a wide bowl (I actually used a bread pan) pour ranch dressing. In a separate bowl (again, I used a bread pan), combine bread crumbs and lightly crushed corn flakes. Dip chicken breasts in ranch evenly on both sides. Next, dip into bowl with combined bread crumbs and corn flakes. Evenly cover on all sides. Place in a greased 9x13 pan and bake at 350 for 35-45 minutes or until chicken is done and tender. In the meantime, this chicken looks delicious! So crispy, and I totally loved dipping my chicken fingers in ranch as a kid. Bringing back memories! Hope you life gets back to normal soon! haha! Sorry about that! I had written it correctly, but the Wordpress Plug-in sometimes scrambles it up when I hit publish. Looks like it did it this time :) It should be fixed now. THanks for bringing it to my attention. The "print" version still has the directions backwards. Thanks for another fantastic idea! Loving this chicken. In a few weeks my hubs will be gone too so I'm pinning this right now! Looks delicious, Nikki. 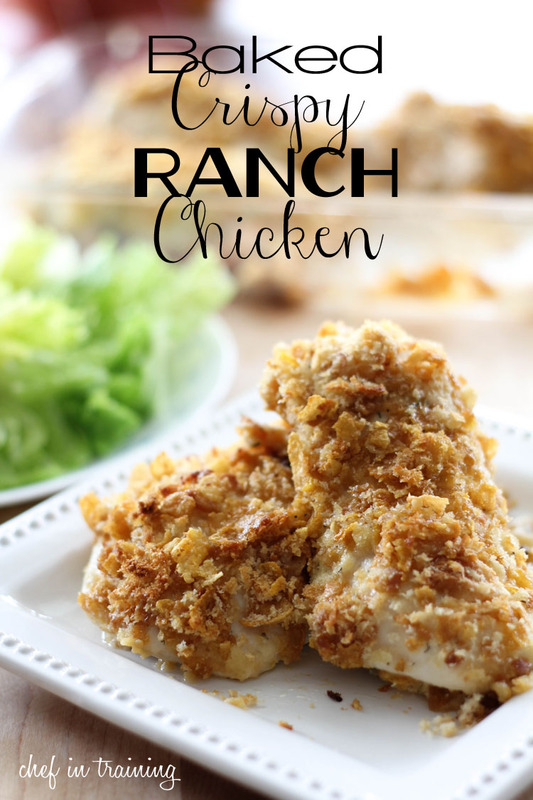 Unfortunately hubby is not a fan of ranch, but I would love this and may make some up just for me for lunches at work. He is a fan of honey mustard. Maybe I will try that also. You have given me lots of ideas to think about. Thanks for sharing. Hope things settle down for you soon. if you don't like ranch dressing, it is equally delicious to copy the recipe but replace ranch with mayonnaise and add a little parmesan cheese (even the Kraft brand in the green can) to the bread crumb mixture for more flavor like half a cup or so. DELICIOUS! aww nikki! I feel like when it rains, it POURS! it's tough and you deserve a fresh breath of air! on a lighter note - this crispy chicken... literally is making my heart melt. SO EASY! Thanks for sharing...looks delicious! What's the name of the font used for the words CRISPY and CHICKEN? I love it! Gosh this looks so amazingly delicious! Made this tonight for my parents and we love it we cut it into strips its a great quick dinner for when your on the go!! Thanks for the great dinner!!! What kind of breadcrumbs, Japanese panko or regular, woul it be okay to use seasoned breadcrumbs? This looks so good and much lower in calories than regular fried chicken. I will be trying it soon. Thanks! If you put a wire cooling rack on the baking pan to cook the chicken on it will be much crispier and let it sit about 10 minutes before serving. I ran out of regular corn flakes once and decided to try something a bit different. I used frosted flakes and a little Italian seasoning. It's absolutely delicious!! I do it all the time now. Sweet Italian Oven Fried Chicken. Try it, you will love it! Do you know how many calories is in a serving of you use regular ranch dressing? I like rice crispies instead of corn flakes, also the crumbs stick better with an egg mixed in, and the ranch sticks better with dredging the chicken in flour first. I made this recipe and my whole family loved it! Thanks for the recipe! Kim, do you still use the cornflakes along with the Ritza crackers? I made this for lunch today and it was a hit even with my picky-about-textures husband. I love your site; thanks for all the great posts!